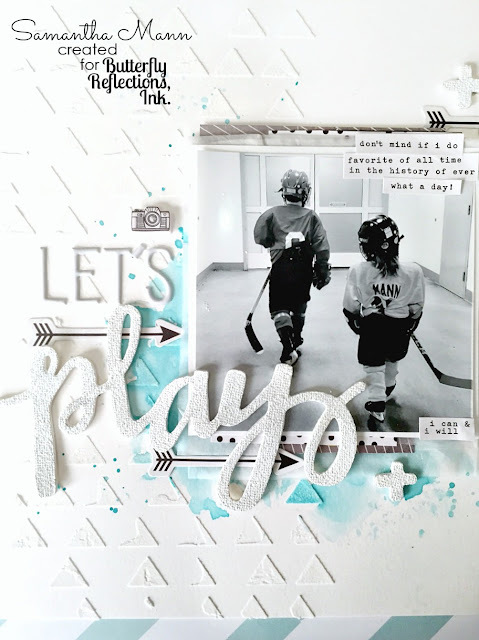 Samantha here, and today I'm sharing a fun layout of my two little Menn! Eek - I love it! To start, I used some embossing paste and a triangle stencil to add some subtle white on white dimension! I used a bunch of papers from various 6x6 paper pads and some recycled tissue paper as layers behind my photo! 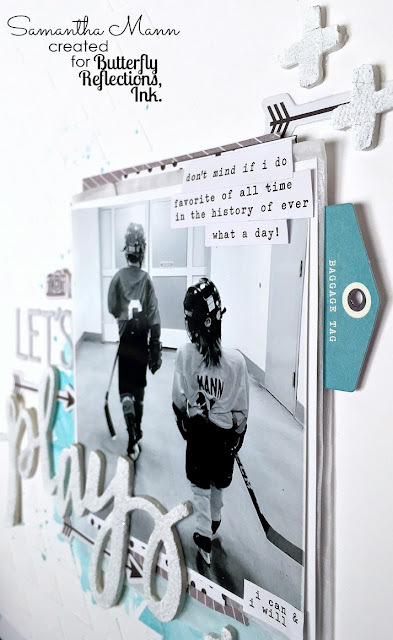 I also used one of the die cuts from the Fancy Pants Life is Beautiful Ephemera as a layer! I used Tumbled Glass Distress Ink and did some slight watercoloring underneath where the photo and title sit, too! And speaking of the title, the gorgeous 'play' word is from the Paige Evans with Pink Paislee Fancy Free Thickers! Instead of keeping the word silver, I used some white paint and made it white! I LOVE the look! it looks like a canvas finish! So that's my layout! Aren't my little Menn :)cute as can be all dressed for their hockey games and ready to play?! Love them! Ha!